Response of Nodularia spumigena to pCO2 – Part 2: Exudation and extracellular enzyme activities. Endres, Sonja , Unger, J., Wannicke, N., Nausch, M., Voss, M. and Engel, Anja (2013) Response of Nodularia spumigena to pCO2 – Part 2: Exudation and extracellular enzyme activities. Biogeosciences (BG), 10 . pp. 567-582. DOI 10.5194/bg-10-567-2013. The filamentous and diazotrophic cyanobacterium Nodularia spumigena plays a major role in the productivity of the Baltic Sea as it forms extensive blooms regularly. Under phosphorus limiting conditions Nodularia spumigena has a high enzyme affinity for dissolved organic phosphorus (DOP) by production and release of alkaline phosphatase. Additionally, it is able to degrade proteinaceous compounds by expressing the extracellular enzyme leucine aminopeptidase. As atmospheric CO2 concentrations are increasing, we expect marine phytoplankton to experience changes in several environmental parameters including pH, temperature, and nutrient availability. The aim of this study was to investigate the combined effect of CO2-induced changes in seawater carbonate chemistry and of phosphate deficiency on the exudation of organic matter, and its subsequent recycling by extracellular enzymes in a Nodularia spumigena culture. 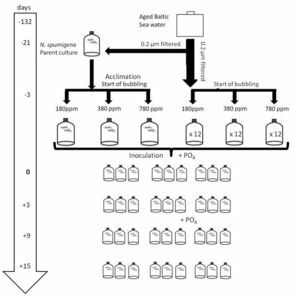 Batch cultures of Nodularia spumigena were grown for 15 days aerated with three different pCO2 levels corresponding to values from glacial periods to future values projected for the year 2100. Extracellular enzyme activities as well as changes in organic and inorganic compound concentrations were monitored. 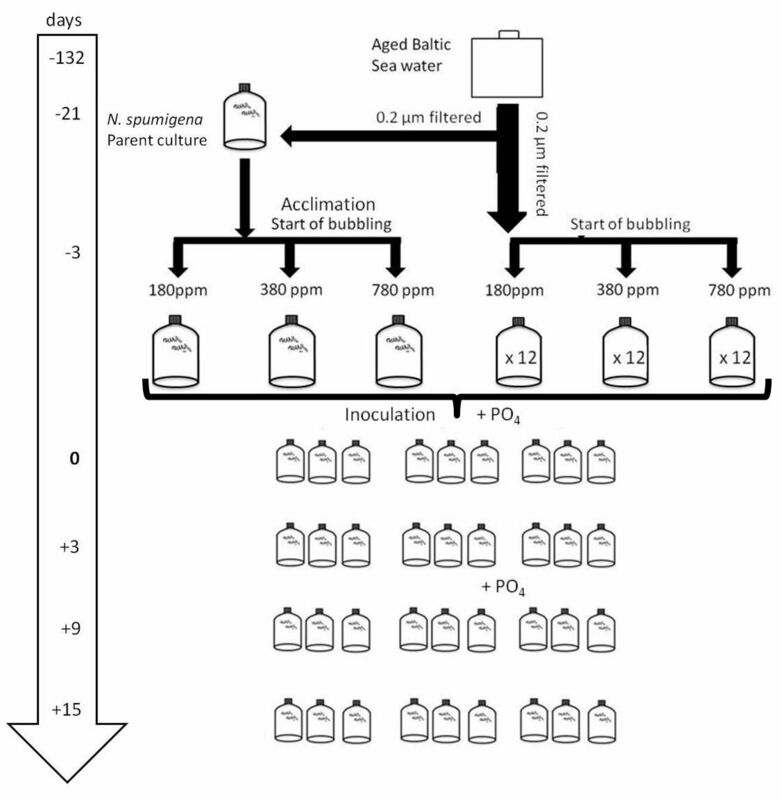 CO2 treatment–related effects were identified for cyanobacterial growth, which in turn was influencing exudation and recycling of organic matter by extracellular enzymes. Biomass production was increased by 56.5% and 90.7% in the medium and high pCO2 treatment, respectively, compared to the low pCO2 treatment and simultaneously increasing exudation. During the growth phase significantly more mucinous substances accumulated in the high pCO2 treatment reaching 363 μg Gum Xanthan eq l−1 compared to 269 μg Gum Xanthan eq l−1 in the low pCO2 treatment. However, cell-specific rates did not change. After phosphate depletion, the acquisition of P from DOP by alkaline phosphatase was significantly enhanced. Alkaline phosphatase activities were increased by factor 1.64 and 2.25, respectively, in the medium and high compared to the low pCO2 treatment. In conclusion, our results suggest that Nodularia spumigena can grow faster under elevated pCO2 by enhancing the recycling of organic matter to acquire nutrients.